Miss Zhuang Xiu-zhen (in the middle) and Mr. Liu Fu-jing at her left. Miss Zhuang Xiu-zhen 莊秀珍 is the president of the Tian Muge Silk String Qin Society. 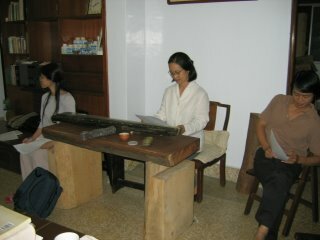 She learned Guqin from Master Sun Yu-qin 孫毓琴. This qin society used to have gatherings twice every month at the Zi Teng Lu Tea House, and now moved to Xin Dian near Xin Dian city hall. I had the honor of attending their meeting on Oct 17th, Thanks to my friends Shan-wei and Xing-yi. Once there, I had a chance to play Miss Zhuang's Tang Qin 秋籟 and one of the qin made by Mr. Yei Shi-qian 葉世強. (Mr. Yei was born in Guangdong and moved to Taiwan in 1949. He is 80 years old now and has been living in solitude almost his whole life in Taiwan. 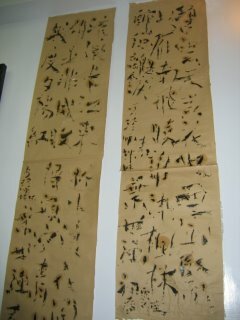 His artistic works include: paintings, mixedmedia, calligraphy and qin making.) The Tang qin feels very warm and comfortable to play. It has snake belly cracks 蛇腹斷紋 but had redone the lacquer so the surface is smooth. The Yei qin has an artistic look and the sound quality is not open but restrained. It does not have shiny lacquer but an ancient look. I heard several people's qin playing. Xing-yi played Yu Ge 漁歌 that he dapu from Wu Zhi-zhai Qinpu 五知齋琴譜. Xing-yi learned qin from Master Zhuang Xiu-zhen for 2 years and had been playing qin for 5 years. Mr. Pan commented that Xing-yi's Yu Ge is very 悲愴 (tragic) like the sorrow of swan lake. Xing-yi's shixong, Mr. Liu Fu-jing 劉富錦 played Wu Ye Wu Qiu Feng 梧葉舞秋風, very impressive. Mr. Liu learned qin from Master Zhuang the longest. He is also master in qin making. 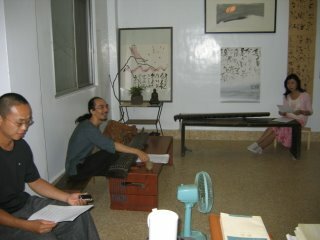 Currently Mr. Liu is supervising several qin makers in Mainland China. Master Zhuang Xiu-zhen played the Ping Sha Luo Yan which was taught by Master Sun Yu-qin. Mr. Pan gave very high appreciation of her playing of the Pin Sha Luo Yan. Mr. Pan Bo-shi, the standing one. 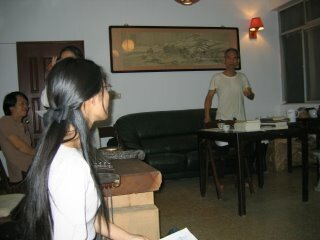 Later, Mr. Pan Bo-shi 潘栢世 gave a talk of Twenty-four Grades of Poetry 二十四詩品. He gave his explanation of the first two grades – Xiong (plentiful, magnificent) Hun (complete, all over) and Chong (rinse, infuse) Dan (light) (雄渾 沖淡) at that day. Mr. Pan is a very knowledgeable person. He is a major in Chinese medicine but he also studies Chinese philosophy and literature. He has given lessons at the Tian Muge Silk String Qin Society before on the Twenty-four Qin Situations 二十四琴況. He does not play qin but he knows how to appreciate qin very well. Mr. Pan said that all the Chinese art, such as seal, Kung-fu, tea, etc,. are related to the 24 Grades of Poetry. All the Chinese art has to be based on the deepest Chinese literature. Each grade of the 24 Grades of Poetry is literature which is the door to enter the world of Chinese art. Chinese art and the Chinese art environment cannot be separated, such as when to listen rain? When to play guqin? etc,. It has to be in a certain situation to do certain thing in order to be beautiful. Each two of the grades of poetry is corresponding to each other. Xiong Hun is corresponding to Chong Dan. Xian Nong 纖穠 is corresponding to Chen Zhuo 沉著 and so on and so forth. Each two phrases of each grade is also corresponding to each other. Such as the first two phrases of the first grade, 大用外腓 is based on 真體內充, meaning that the great graceful appearance is based on the true inner richness. Another two phrases, 反虛入渾 積健為雄, meaning that it has to be in a big space in order to enter the original inner truth. And the powerful energy comes from accumulating exercise. And the last four phrases of the first grade, 超以象外 得其環中, 持之非強 來之無窮 meaning that crossing over the limitation, a living thing will live forever without the limitation of time. When holding it, you don't feel it is strong but you will feel the power later when you hold it longer and longer. After Mr. Pan's explanation of the first grade, I just realized how rich the Chinese literature is. On the wall, there are the paintings and calligraphy by Mr. Ye Shi-qian. Mr. Liu Xing-yi is the one in the middle.